Luchador! 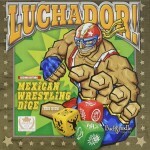 Mexican wrestling dice is a fast- rolling, hard-hitting, body-slamming, neck- crunching, chair-smashing, table-slapping dice game for 2 to 6 players. Pickomino is a fast paced press your luck dice game where two to seven players, ages 8 and up try to obtain fried worms for their chickens, so that they do not go hungry. A game where you get to play the villain. 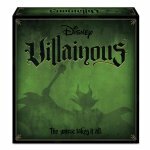 In this epic contest of sinister power, take on the role of a Disney villain and strive to achieve your own devious objective. 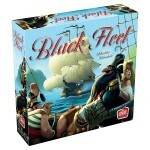 Discover your character’s unique abilities and winning strategy while dealing twists of fate to thwart your opponents’ schemes. Find out who will triumph over the forces of good and win it all! 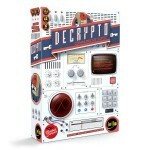 A party game where teammates try to transmit secret codes without letting the opposing team intercept them. In this fantastic arena, the most popular spectacle is about to begin, a footrace between 25 athletes like Siren, Witch, Centaur etc... 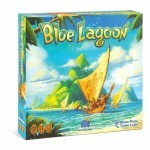 These creatures are teamed up to win this exciting run. This game has two stages. At the draft, you pick up your athletes. And another stage is of course, the race itself.